August 9, 2016: Site furnishing has shipped and will be installed on Monday, August 15, 2016. July 25, 2016: Hampden Park Improvements are nearing completion. 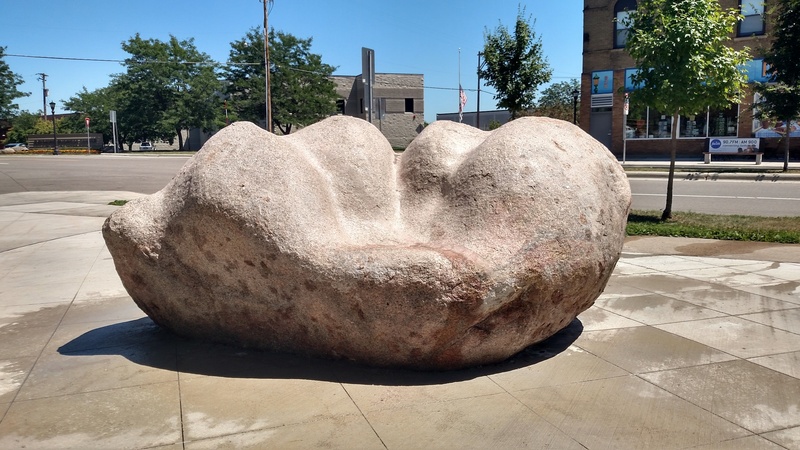 The artist, Zoran Mojsilov, has completed his installation of a stone piece titled Divan. Divan is a granite boulder that Zoran carved and placed within the plaza. Benches, picnic tables, bike repair station and solar charging station are to be installed the week of August 8th. Hampden Park construction will begin mid-July 2016. Meetings: There will be two Design Advisory Committee Meetings and a broader public open house. Meeting dates and descriptions below. Meeting #1 December 18, 2014 6-8pm Saint Anthony Recreation Center INITIAL WORKSHOP: This initial workshop will involve review of the master plan from 2010. City Staff will assemble information from the survey, site observations, review master plan goals, objectives and programmatic potential for this meeting. Outcome: The Committee will evaluate relevance and provide input on needs and preferences on design direction for the park. Meeting #2 January 15, 2015 6-8PM Saint Anthony Recreation Center DEVELOPING A VISION: Staff will present up to 3 schematics to the advisory committee including plans, precedent images and graphics to support the design intent of each. Outcome: The Design Advisory Committee will discuss and provide direction on a preferred direction including overall layout, design elements and style. Meeting #3 January 27, 2015 6-8PM Saint Anthony Recreation Center COMMUNITY OPEN HOUSE: Present final conceptual plan. Outcome: Participants will have the opportunity to provide comments and an opinion on the overall plan. Input will be incorporated into tweaks to the final plan. The City has secured funding to revitalize Hampden Park. We are looking for representatives to serve on our Design Advisory Committee who will help guide design for the park by providing input on the vision, desired amenities, layout and style for Hampden Park. Please contact Alice Messer by December 8, 2014 if you are interested in participating in the Design Advisory Committee.